If your life has been anything like mine has been lately, then quick biscuits are for you. 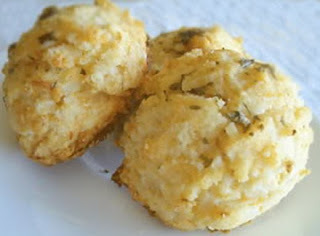 When in a pinch whip up a batch of Dill or Cheesy Garlic drop biscuits in a flash with ready made baking mix. Combine baking mix and milk in a large mixing bowl. Mix until a soft dough forms. Drop a spoonful of dough onto a non greased baking sheet. Bake in preheated 450 oven for 8-10 minutes. If you have enough time, the dough can be rolled out and cut with a biscuit cutter. (Seems I never have enough time for that step) Makes about 10 biscuits. Notes: I have added other dried seasonings to this mix. Garlic powder doesn’t work so well, it looses flavor even when the amount is increased. For a nice biscuit to serve with a bowl of chili con carne, substitute 1/2 cup corn meal for baking mix, and add 1tsp chili powder. When my fresh dill is ready to harvest you can bet I'll be using it rather than dried. Prepare biscuits as above omitting dill and adding 1/2 cup cheddar or your favorite cheese. Bake as directed above. Meanwhile, melt 2 tbsp butter or margarine. Mix 1/4 tsp garlic powder with melted butter. When baking is completed, brush with butter. Notes: I have used mozzarella cheese and later sprinkled warm biscuits with Parmesan after brushing with garlic butter. Ready made mix too expensive? My friend had nine children, yep nine. She always made her own baking mixes, seasoned french fries, and most other common ready made foods. Try making you own. In a large bowl, mix flour, baking powder, sugar, and salt. With a pastry blender (or wire whisk or fork) cut in shortening until mixture resembles coarse crumbs. If you're using a wire whisk or a fork, make sure you mix it well. Mix it until it looks like...well, like Bisquick. This mix stores in an airtight container for about six weeks in the pantry or up to six months in the freezer. Note that the freezing method doesn’t work to well for times when you’re in a hurry as it must be thawed before using. I always think about making a baking mix like this, but I've never tried it. Those biscuits sound yummy, though! Perfect with a bowl of soup! Thanks for providing the homemade baking mix recipe - so easy! I love superquick recipes like these! Thanks for visiting my blog. Juno. Sound even easy enough for me. Could you use bought baking mix..ie: bisquick? Cookin' Canuck Yes very easy and economical! Jhonny walker I agree, herbs and garlic are always a winner! Vodka Logic Yes any baking mix-Jiffy, Bisquick, Generic- will work. Oh..I am so excited you posted this!! My family is going to just love them. Thanks! Thanks for the recipe, I love dill so I'm sure I could manage these quite well. I agree with the commenter that these would be great with soup. My husband is going to love these,thank you so much!! Looks very good, I love biscuits! I used to make these biscuits when I was a kid. Mom would have me make them when we had stew for dinner! I'll have to make them again...yum! I am a huge fan of garlic cheese biscuits! YumYum!! These look delicious! Love the flavors and also that they are drop biscuits. Easy-peasy. Such a good idea to make your own baking mix. I am going to have to try making dairy free and gluten free biscuits now! Stephanie Please let me know how they turn out! I love biscuits and I think these sound so good! I am going to try them real soon! Happy Eating!